Titanfall, arguably one of the best games available for the Xbox One, also has some of the most interesting and fresh character and bot designs (from the amazingly talented Joel Emslie) I’ve seen in a game in a long while. The incredible art direction, along with the high pedigree of the game’s developers forced me, a non-XboxOne-owning-PS4-guy, to scoop up the game for my PC the second it was available. I played it almost religiously for months, squeezing in a round or three whenever I could, to step up my game, marvel at the graphical spit-shine and beautiful giant robots adorning my screen. While I’m certainly not the best player in the game, because of it’s exciting character/bot designs and new twist on the ol’ FPS formula, it has a special place in my video game addled heart. 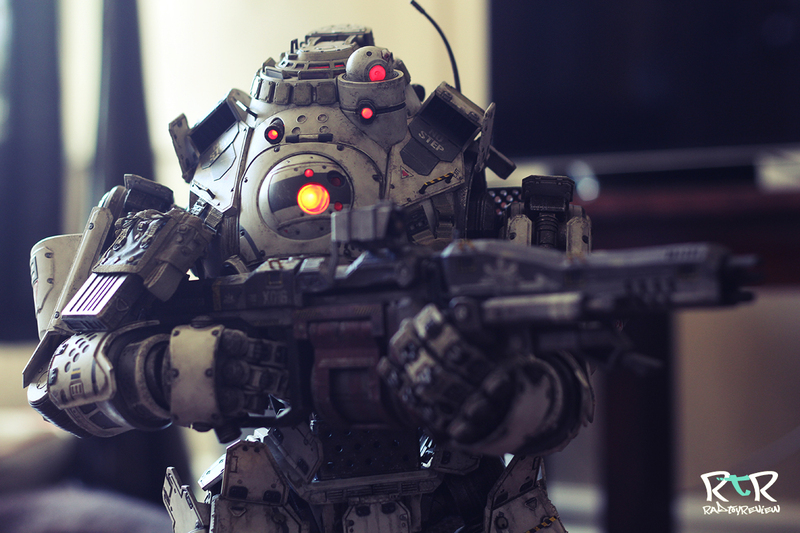 I often find myself thinking, “I should try to play Titanfall today when I get home from the office”. Unfortunately, as is so often the case, life gets in the way and my time to spend playing video games isn’t frequent. 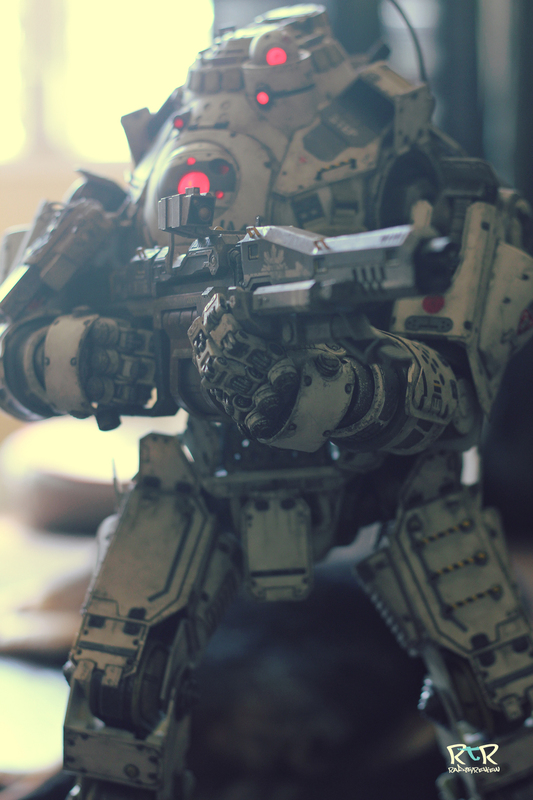 But when I read Threezero’s announcement that they were working on toys for Respawn’s massive hit, my ears perked up and my pulse quickened. Unexpectedly, my mouse/trigger finger started twitching. 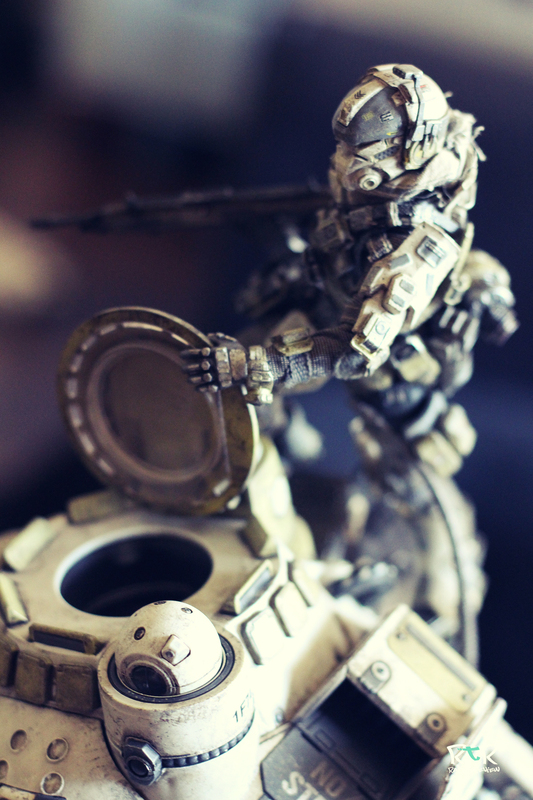 I hit save on the Zbrush sculpt I’d been working on and found myself swept back into to the world of Titanfall. Stomped, punched and shot by these lovely Titan’s all over again. And I loved it. 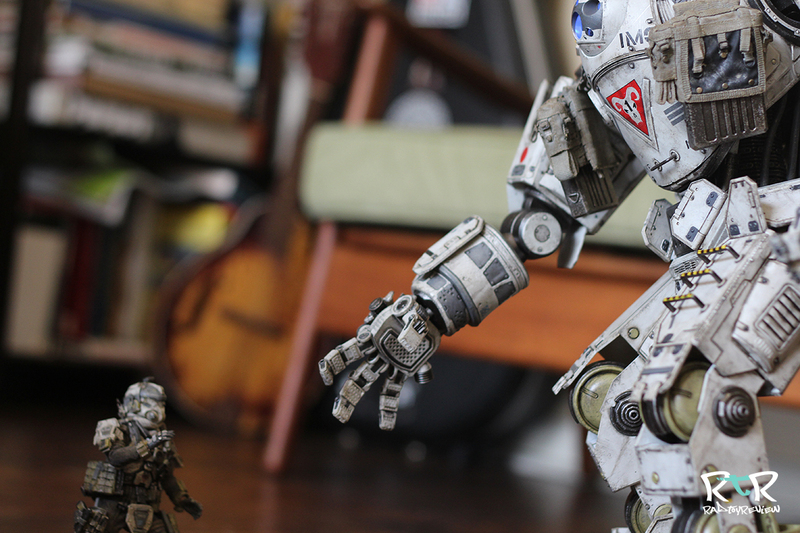 I seriously haven’t been so excited to see a toy manifest since ThreeZero started trickling out production shots of Atlas and his pilot, months ago. But I had to question, given the insanely complex robot designs and details layered upon details.. how any toy company could pull it off properly? 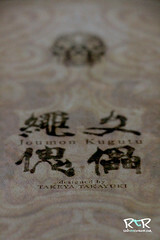 Well, sometimes it pays to have faith and when it’s coming from ThreeZero, I have a LOT of faith. We did two preview videos of Atlas and the Pilot you should check out below! Take a second to subscribe to our Youtube channel as we’ll be posting a lot more over there more frequently and we would’t want you to miss a thang! Stunned. I’m not remotely exaggerating when I say that I was stunned.. floored by the size and level of detail on this guy. Atlas is just massive! 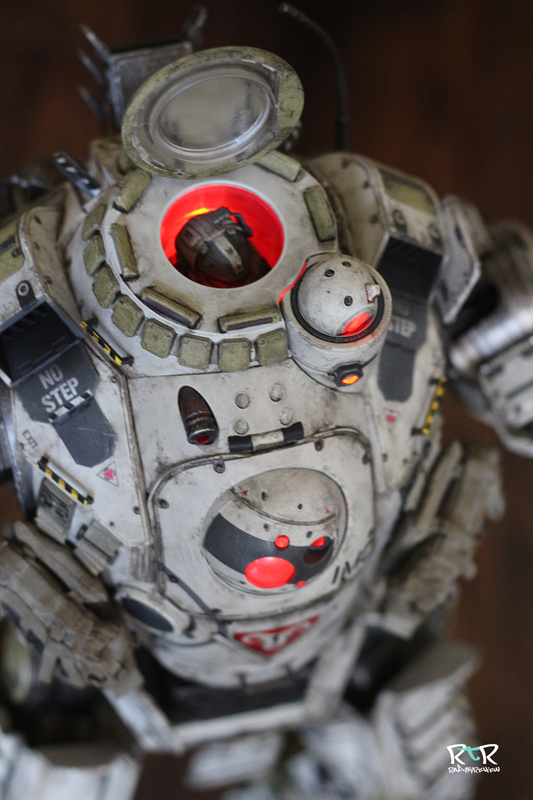 Over 20 inches tall, he towers over every other thing in my collection. 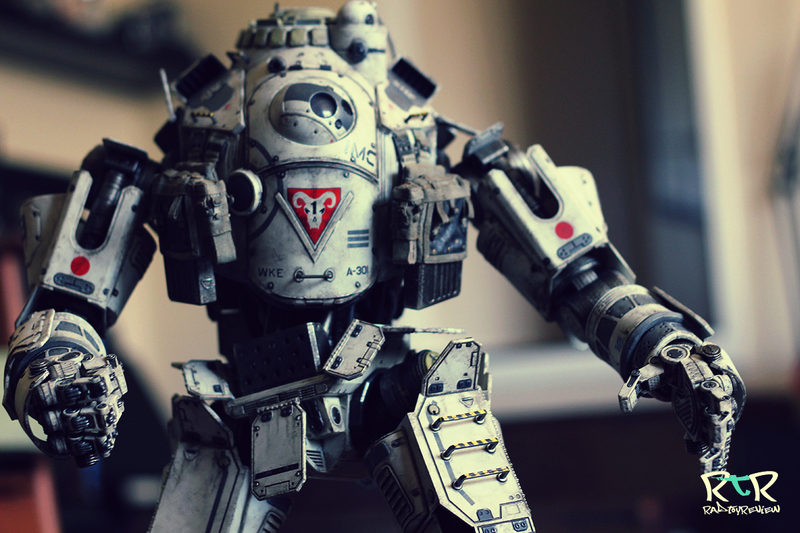 Every rivet, grate and panel from the in-game Titans is here. 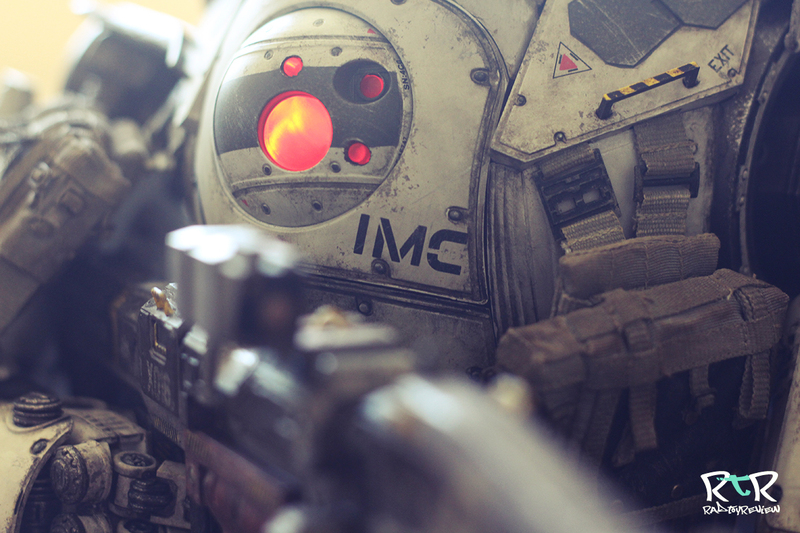 From the logos and decals to the cloth ammo pouches and light features, the detail is just insane. 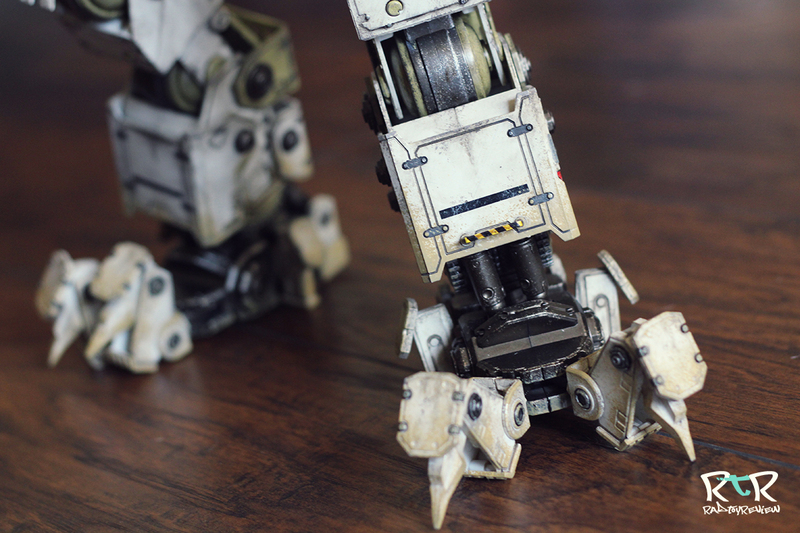 The deceptively simple paint scheme is no slouch with beautiful and precise weathering. Those familiar with ThreeZero’s work will no doubt be familiar with their eye for detail but should definitely appreciate here given the expectations surrounding this guy. Atlas is a looker and if you’re the kind of person who whistles at toy robots.. you’re a very strange person indeed and probably need to get out more.. but Atlas is without question, catcall worthy. 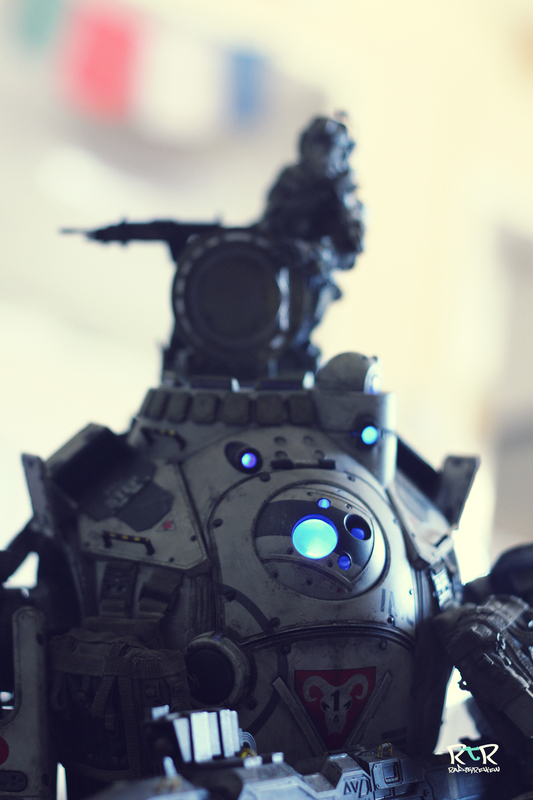 A Titan wouldn’t be much on the battlefield without his pilot. All that attention and care to detail has carried over to the Pilot. 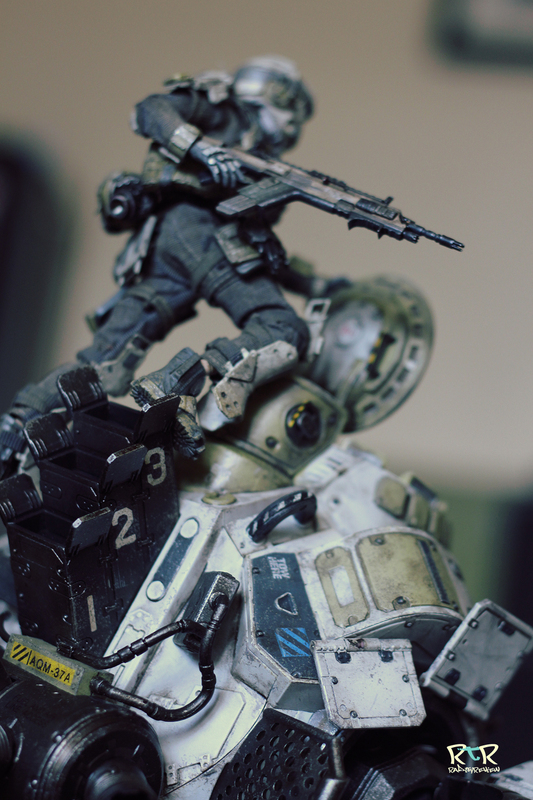 If you’re familiar with ThreeZero or 3A toys, then you’ve no doubt seen or possibly own a few of their 1/12 scale figures and have a pretty good idea of what they’re capable of achieving at that scale. 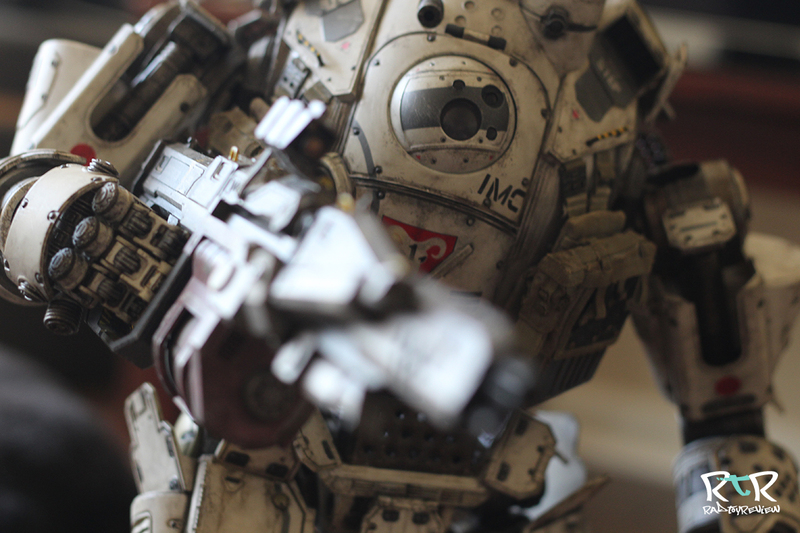 I’ve been collecting stuff from 3A and ThreeZero for years now and I can tell you this from experience.. the level of detail on this Titanfall Pilot, blows anything they’ve previously done at that scale completely out of the water. The combination of real, perfectly scaled cloth garments overlapped with beautifully detailed molded body armor gives a realistic look. 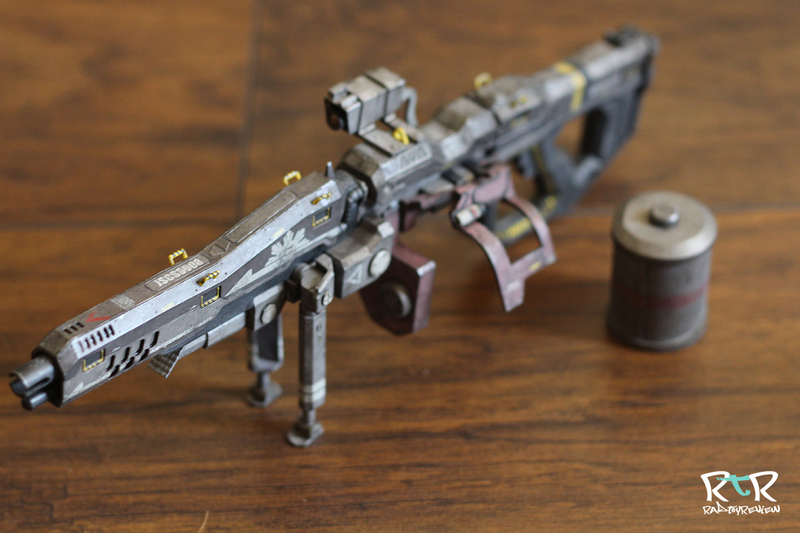 So much so, there were a few parts, like the molded pistol that I initially thought had to be removable. Sadly, it isn’t.. but given the tiny size of it.. it’d been the first thing I’d lost out of the box anyway. Some of the armor pieces are sewn to the cloth but it looks like you could strip off the majority of it if you wish to customize his look a little. The official images of him over on ThreeZero’s Facebook page clearly show he has a “kung fu” grip for holding his rifle properly, so I’m thinking that when the final version of these guys actually ship out, he’ll come with a couple variations of hands. In the meantime, I’ll be wedging his rifle under his armpit to fake it. Jumping back over to talk about our big boy, Atlas. 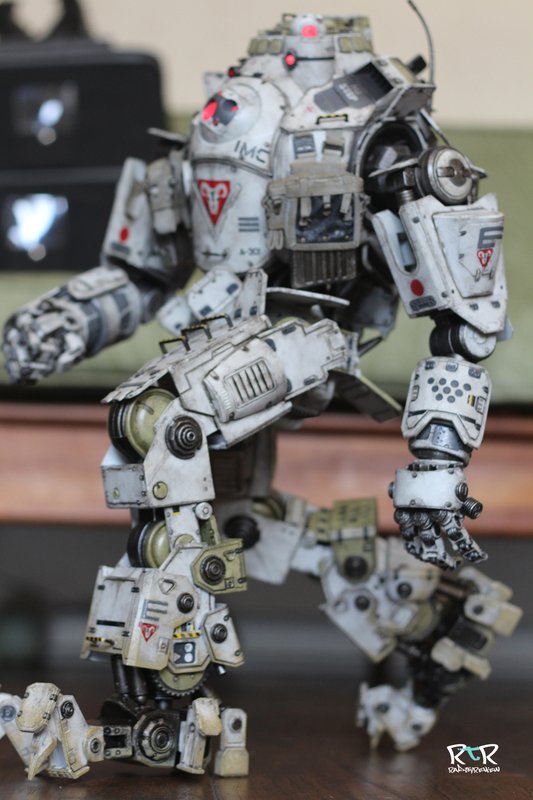 With over 100 rotating, moving and pivoting bits and pieces, all the detail jammed on him doesn’t seem cost Atlas a thing when it comes to articulation. 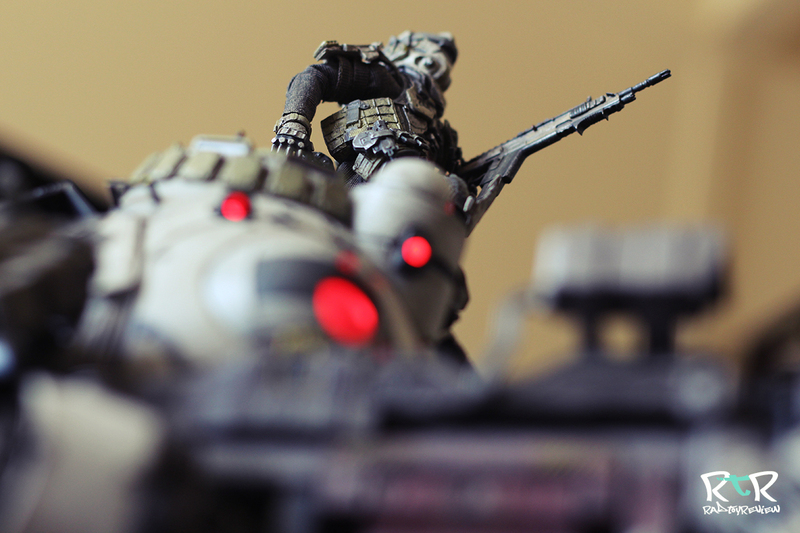 He’s actually fairly easy to pose and move around, especially given his size and complexity. Occasionally you’ll have to flip a panel out of the way before you can twist his leg or arm a certain way, but overall, it’s a seamless affair. Probably the most important place for Atlas to have range of movement is in his arms. Thankfully, they can go about as wide or close as you’d ever need them to for holding his gun, scooping up the pilot or punching other bots in the face. Of course the fingers are articulated and detailed right down to the circle grid pattern on the palms that anyone who’s played the game will recognize. His torso is essentially a big ball joint. There are several rubber hoses attached under his midriff that keep him from spinning like a top, but you can twist and turn him pretty well in all directions. I was happy to see that all of his joints either click/lock into place or firmly hold however you pose him. 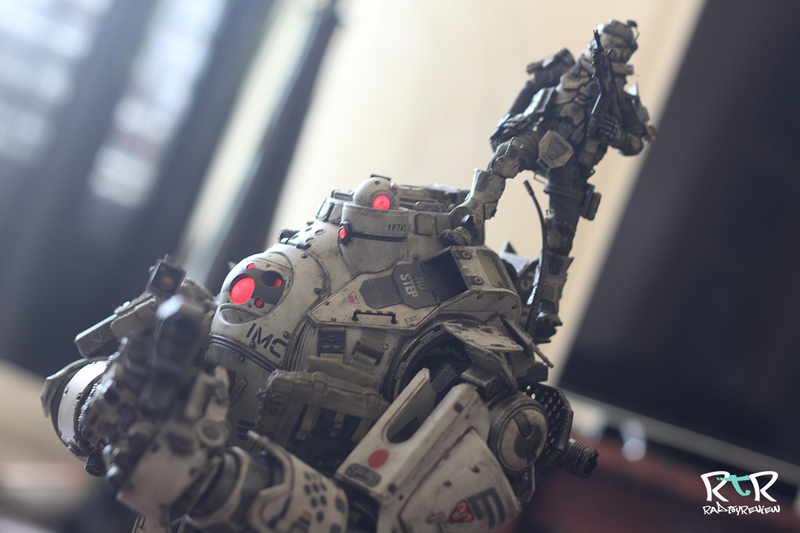 When I first pulled Atlas out of the shipping box I thought for sure he’d be incredibly top heavy and difficult to balance. I mean, he’s over 20 inches tall and at least half of that goes to his fairly skinny long legs. I was very surprised just how easy he is to balance. In his legs, he’s got a hip joint that is pretty forgiving and will let him get some relatively wide stances. There’s a pivot joint in there as well to allow for some leg rotation around the Y axis. The knees bend only about 45 degrees (photo above) or so which isn’t quite as much as I’d like them to but serviceable. There’s also a mid-calf joint I’ve called a “Pans Labyrinth” joint before… not really sure it makes a lot of sense to anyone else.. but it reminds me of the goat legs of Pan.. so I’m sticking with it. These rotate forward or back to allow for deeper dips in the legs. 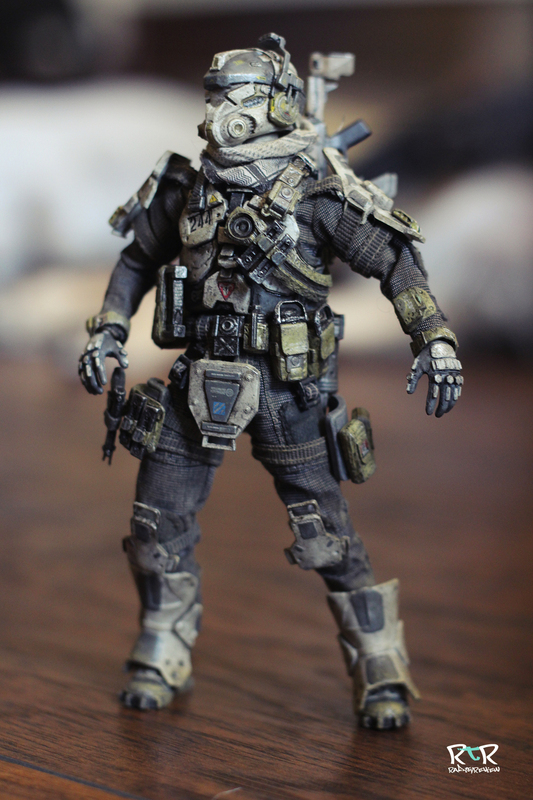 I’ve been asked by several people if he is able to do the kneel pose from the game when he loads or unloads a Pilot. Now that I’ve had some time to play around with him, I can say that unfortunately no, or at least.. “not quite”. It seems like some real world physics are getting in the way via plastic smacking against plastic. Unlike the video game world where you can cheat physics whenever an animation calls for it, ala pieces of armor, weapons, metal, etc.. clipping into each other. So no, he can’t do the in-game style kneel, but you can get something together decently close. As I was talking about how well he balances, the toe spikes on his feet extend out and really save the day here. Even on the soft-ish surface of my leather ottoman, thanks to those spikes, he was standing tall and safe. Scattered all over this big fellah is little flaps and movable panels. While you’ll need to scoot some of them out of the way to get a certain pose, most of them seem to be there to play and fiddle around with. 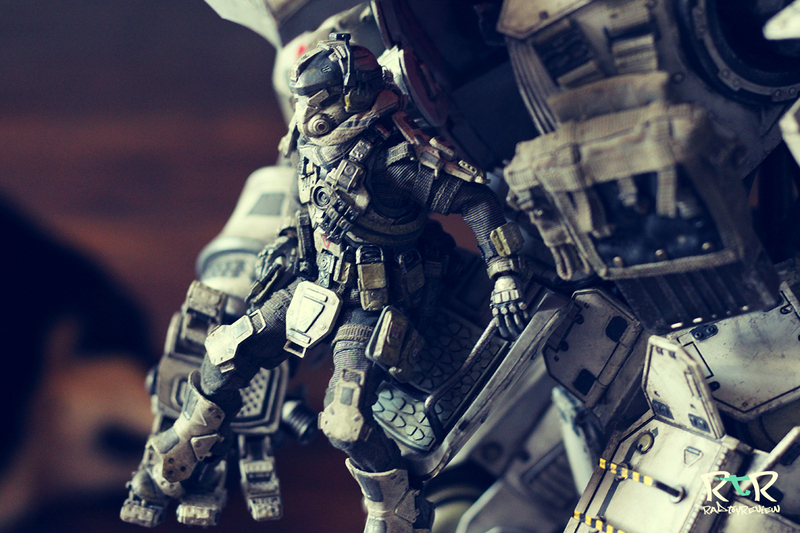 An impressive feat at any scale is the level of articulation ThreeZero crammed into the 1/12th Pilot. He basically has all the rotating and pivoting joints you’d expect on a high quality 1/6 figure which lets you get him into a lot of great poses. He is hindered somewhat by the molded body armor.. particularly on his torso.. but It didn’t hinder the play-ability at all, to me. I did find that his boots popped off a fair bit, particularly when trying to put him in the cockpit of his Titan. The one problem with that is the little double ball joint that holds the boot to the leg can get pushed down into the boot, making it tricky to reattach to the leg. It wiggles out pretty easily if you use your fingernail to gently pry out, but it’s odd that there’s so much play in there since you have to press the leg and boot together to reattach it. Doing so can again cause the double ball joint to push back into the boot, ad nauseam. 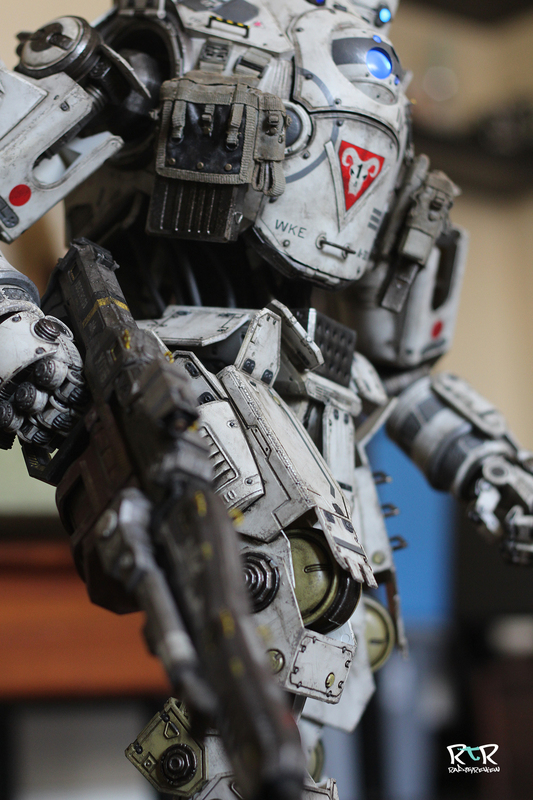 Both Atlas and his pilot come with (of course) nicely detailed guns. Altas lugs around the XO-16 which has a removable ammo drum and bipod legs that pop out on the sides. Worth mentioning again is that if you order it from ThreeZeroStore.com, you’ll also get the exclusive Arc Cannon as well. The Pilot carries with him the R-101 Compact Carbine… well, he WOULD carry it if I had the right set of hands.. but you know what-tah mean! I’m glad the guns are made of a hard molded plastic and not the softer stuff some other manufacturers use for weapons as I’m the guy who always ends up with the forever bent gun barrel..cough cough.. SNAAAAAKE! I have a few figures with lighting feature that I haven’t even bothered to mess with simply because I have to unscrew five different things to get to the battery cover, only to then have to insert some obscure battery only sold in the remote areas of the Netherlands and then remove another half dozen panels via custom made allen wrench to access the on/off switch. Well, ThreeZero made my day by. Not only sending me this to review.. but also by designing Atlas to take two, easy to find, standard issue, AAA batteries. Just pop them into the easy to remove panel on his back and you’re ready to rock.. no screw drivers, ratchet set or tweezers required. I’d say it’s definitely worth doing so too as the lighting effect looks fantastic! The light switch has three positions: Off, ON/Red and ON/Blue. A little extra something-something for those who have a preference! 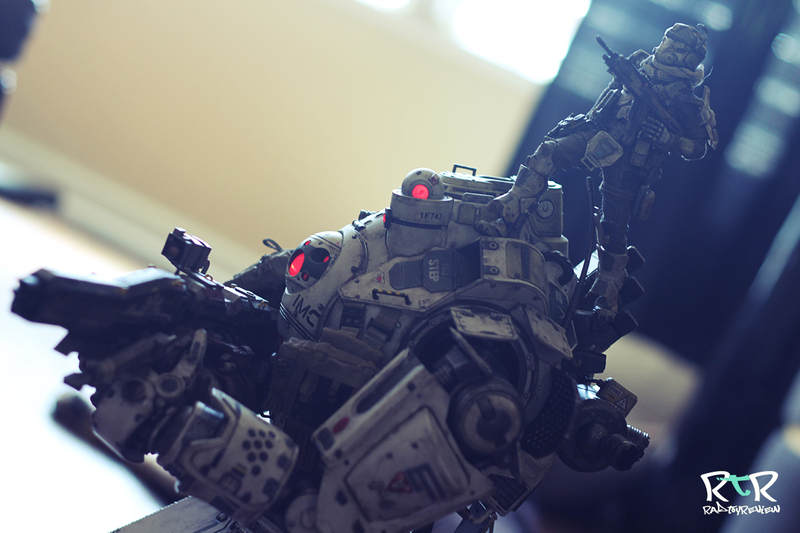 So you’ve got your Titan and you’ve got your Pilot. Obviously, at some point.. the Pilot has to pilot.. right? Well, we can do that! That said, getting the pilot into the cockpit of his Titan is a tad trickier than I expected. The pilot fits fine once he’s in.. but I imagine he’d be feeling a little claustrophobic as snug as he is in there. 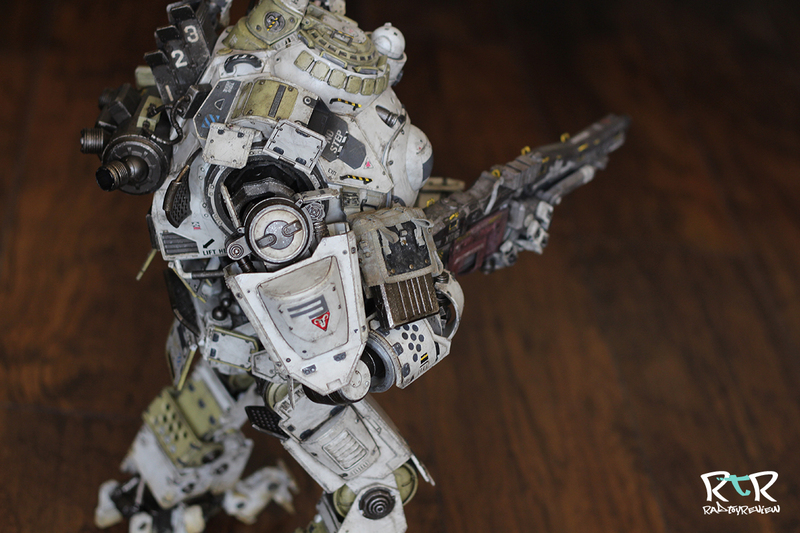 If you want to see how it’s done, check out our Titanfall – Atlas video on our youtube channel (or just click the video at the top of this review). I found that it helps to use your finger to guide his head up to point up towards the top hatch while working him in through the front bay. Hmm. That sounded slightly more provocative than it probably should.. moving on! 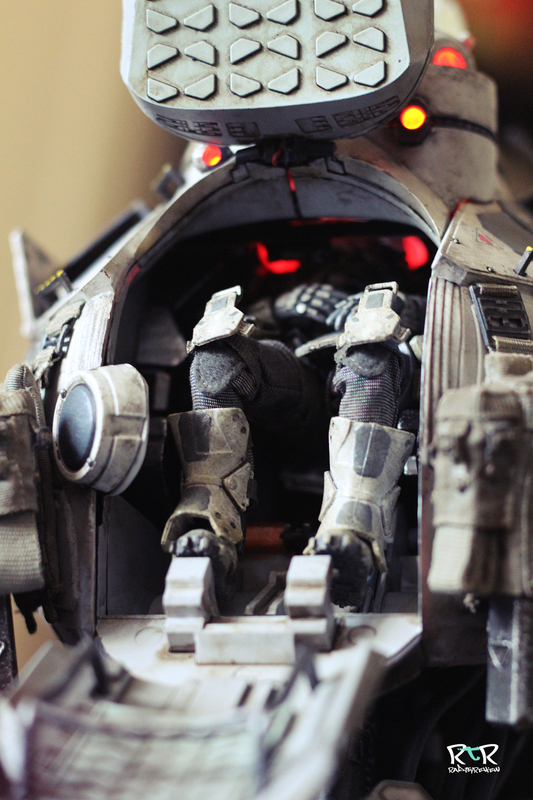 I’m happy you have the option of popping him in there but since you can’t see the pilot when he’s behind the closed panels and doesn’t look all that awesome tucked in there with the cockpit open, I’ll probably leave him riding piggy back on Atlas when displayed. So there you have it. 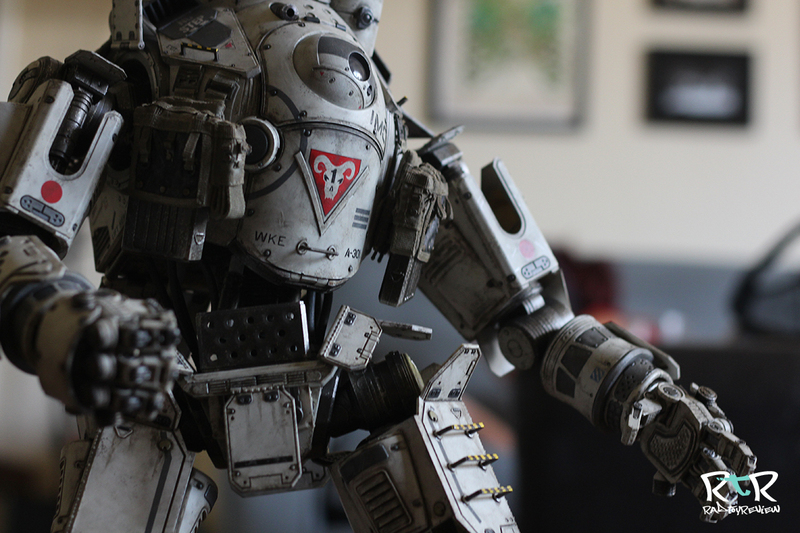 Threezero’s Titanfall Atlus set. 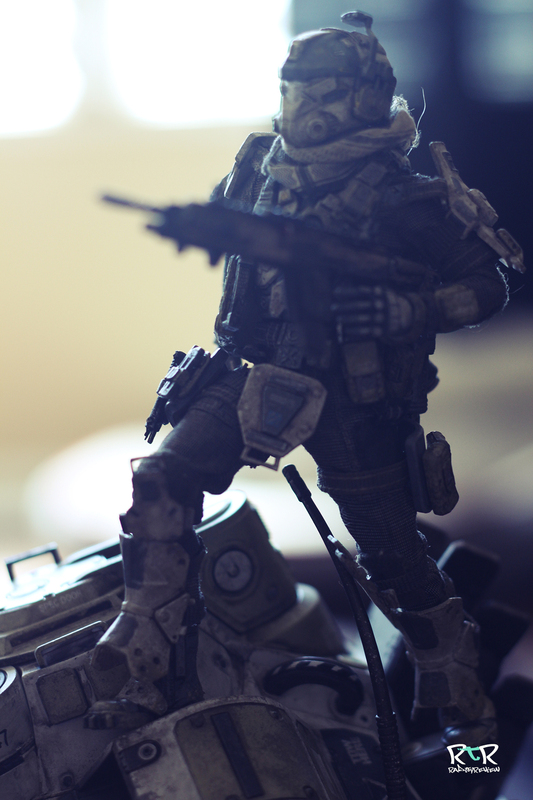 One of if not THE most visually striking figure in my collection. As you can see, both figures are fantastic compliments of each other with almost no stone left unturned in the details department. I can’t wait to see what ThreeZero does next with this line. 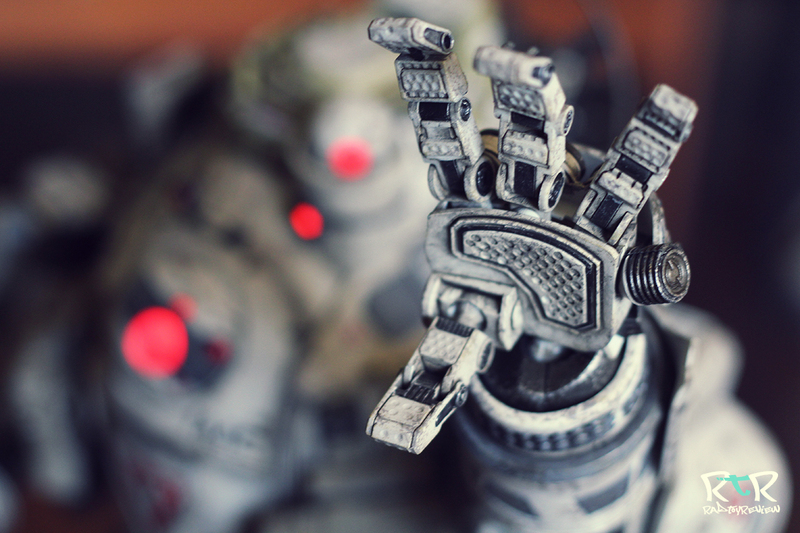 We’ve already been teased with a Stryder prototype photo on their facebook page. 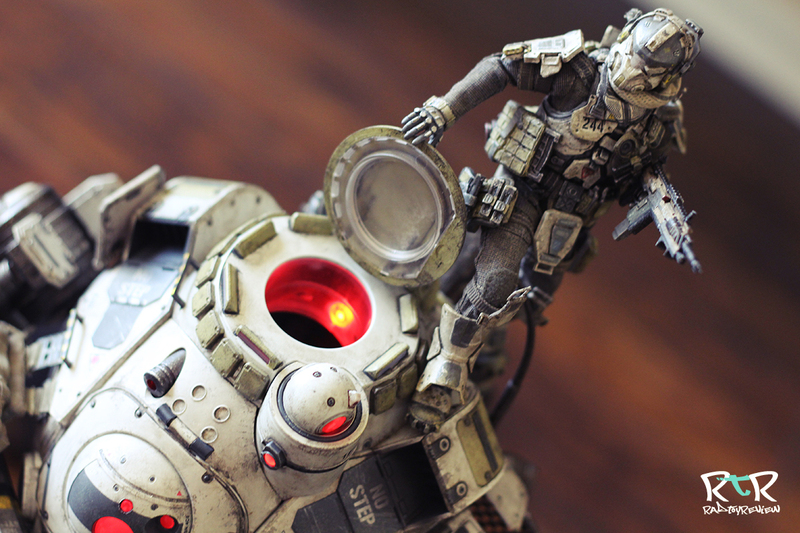 I’m hoping they release the various Pilots individually as I’d love to grab a bunch of them to display around Atlas. 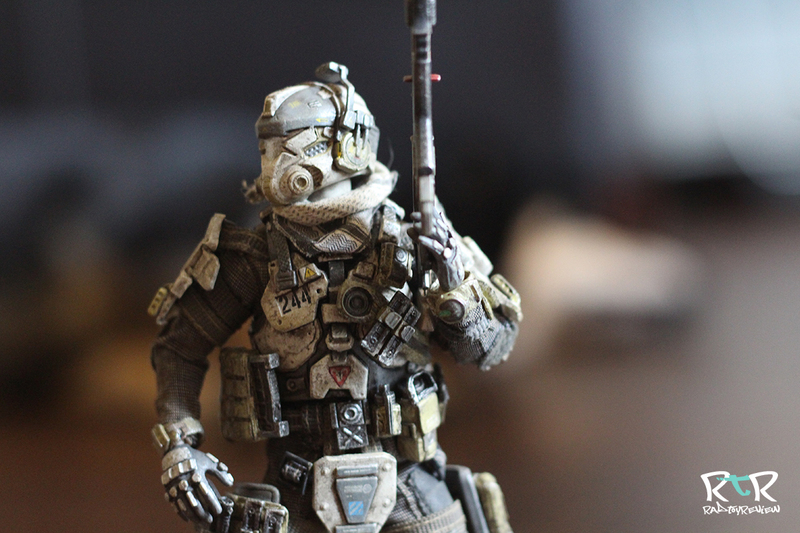 Heck.. maybe a 1/6th Pilot could be in our future. One can dream! 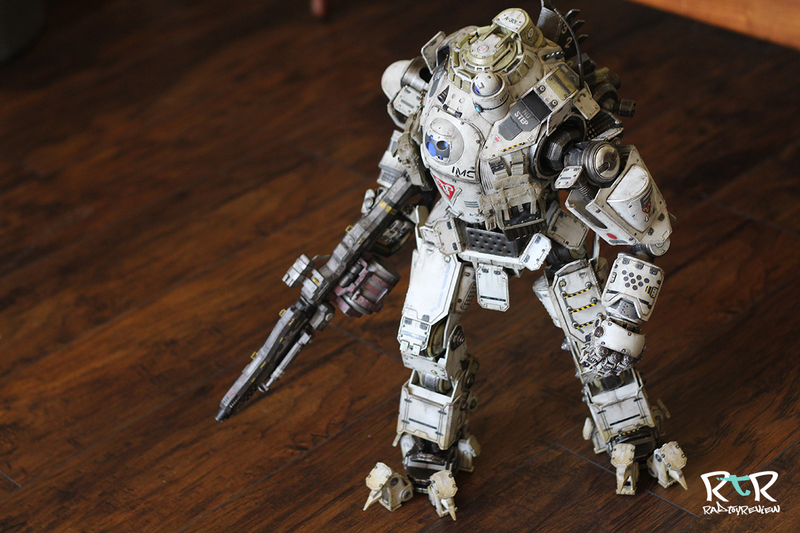 If you like what you saw here and in our videos, are a big fan of Titanfall or simply love absolutely fantastic giant toy robots, then you should run, not walk.. your fingers to your keyboard and go to ThreeZeroStore.com and preorder this giant while you can! 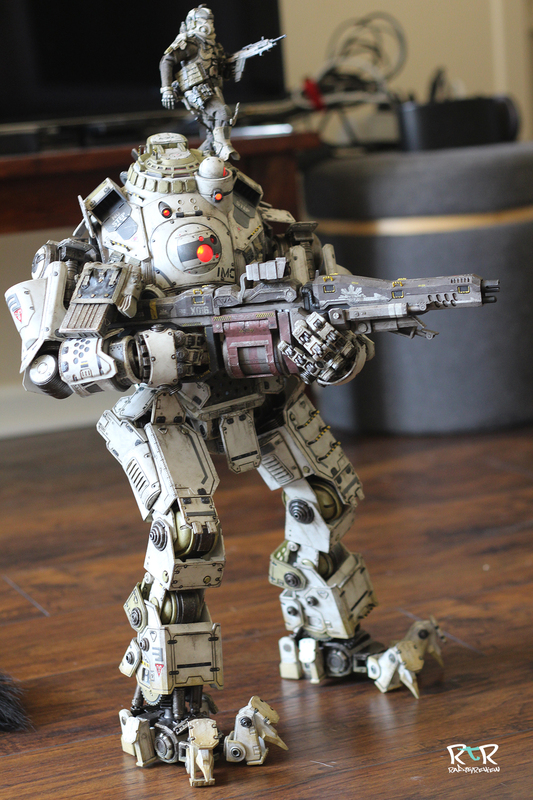 I can promise you, while your wallet may weep softly at first, you won’t give that a second thought once this Titan drops on your doorstep! If you haven’t yet, subscribe to our Youtube channel, RadToyReview as we’ll be doing a lot more video reviews in the near future. Also to stay up to date with whatever we’re doing, whatever we are, follow us on Facebook and Twitter! Thanks again to ThreeZero for shooting me the sample and thank you as always, gentle reader, for checking out RadToyReview!